Carrie Patterson is a visual artist working in Leonardtown, Maryland. Her artwork considers how color, form, and line metaphorically measure the human condition as experienced through the body. Carrie earned a B.F.A in studio art from James Madison University and an M.F.A in painting from The University of Pennsylvania. Additionally, she was a student resident at The New York Studio School where she worked with second generation abstract expressionists: Charles Cajori, Mercedes Matters, and Rosemarie Beck. Her artwork has been exhibited across the country with solo shows in New York City, Philadelphia, Virginia, and Minnesota. In 2017, her solo show titled Lightbox consisted of brightly colored cardboard constructions and stacked floor paintings at Hood Gallery at Mary Baldwin University in Staunton, Virginia. Recently, she has been making painted constructions based off her lived experience of architectural forms and their relationship to the landscape. 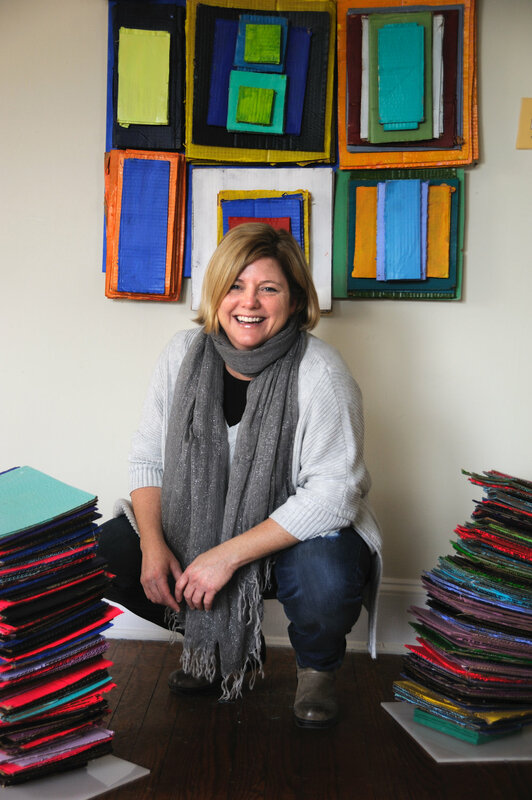 She is a Professor of Art at St. Mary’s College of Maryland, and former owner of Yellow Door Art Studios, a community art school. Her art curriculum called The Yellow Line features lesson plans for early childhood and K-12. She is the author of a Great Course lecture series titled How to See, produced by The Teaching Company (release date August 2019). Filming in the studio for The Great Courses series, How to See.